Ratings are averaged based on 117 reviews. We only stayed at the Sofitel a night either side of our stay on Malolo island but the Sofitel in Denarau is a great resort. Kids loved the waterslide and all the activities. Staff were very friendly as you’d expect in Fiji and nothing was a problem. Our breakfast buffet was included in the cost and was brilliant in its array of food options and quality. The lunch and dinner options at the Sofitel are overly expensive and we found better value at other restaurants in the area. The Beach Bar was being refurbished which would have been annoying on a longer stay. Added bonus is the Fiji Airways counter in the lobby. We checked into our flight and checked our bags from the hotel which was a great convenience. Our room was absolutely beautiful with the best views. All staff were very friendly and eager to assistance. The buffet breakfast was second to none. Would love to spend longer time at Sofitel. Lovely facilities and location very central to Denurua. My daughter and I just recently spent a week at the Sofitel Fiji Resort and Spa and had an amazing time. All the staff were super friendly and accomodating to all our requests and concerns. The food at all the restaurants was delicious and fresh with excellent variety. Poolside activities staff were really friendly and great with the kids and provided many different fun, exciting and sometimea educational activities for the kids (and big kids) every day. All facilities were clean and well maintained at all times. The local entertainers/choir/performers performed a number of times during our stay, and I even received a special happy birthday song sung to me on my birthday in the restaurant which was a wonderful surprise. Everything about the Sofitel was just wonderful, could not say a bad word about any of it and we will definitely be back!! We were at Sofitel for a week and really enjoyed our stay. We got the Oceanside king room. The room had beautiful views. The staff were really helpful and the pool was lovely. We did enjoy our stay there. The staff were welcoming & friendly. We loved the resort and the amazing pool. Location is great. Staff very friendly. Rooms clean but outdated. Food was great but also over priced would go back again though as our experience was very positive. The waitui beach club is a wonderful starting point before exploring the mamanuca and yasawa islands. The staff are their best asset. We had the most amazing holiday in Fiji and at the Sofitel Fiji Resort & Spa. All the staff were absolutely wonderful and they are fantastic with children. Beautiful people. The activity organiser at the pool keep all the children involved and busy which leave the parents to also have a great time knowing that the children are busy. We would especially like to thank Leduna, David, Sali, Nasa, Cody for giving our boys the most memorable and fun holiday. Also like to thank Angel, Alene, Lucy, Justin, Rivkin and other staff from the restaurant that also made our holiday relaxing and memorable. Your service and friendship was wonderful! Vinaka! We were very sad to leave but we will be returning. What a great place to stay, weather was beautiful, staff helpful and friendly. Room was lovely and comfortable, great views and peaceful at night. Would definitely recommend the Sofitel to stay at. We had 5 nights at the Sofitel in April. The resort was pretty much exactly what we expected with our 6 year old especially enjoying the pool and waterslide. The breakfast buffet was substantial and the food overall was ok. The resorts location on Denarau is really good. Short walk to the Marina, Big Bula waterpark and the Golf and Racquet Club. Overall a good family place to stay in Denarau. We would stay again if staying in Denarau. Most enjoyable holiday with family and friends. 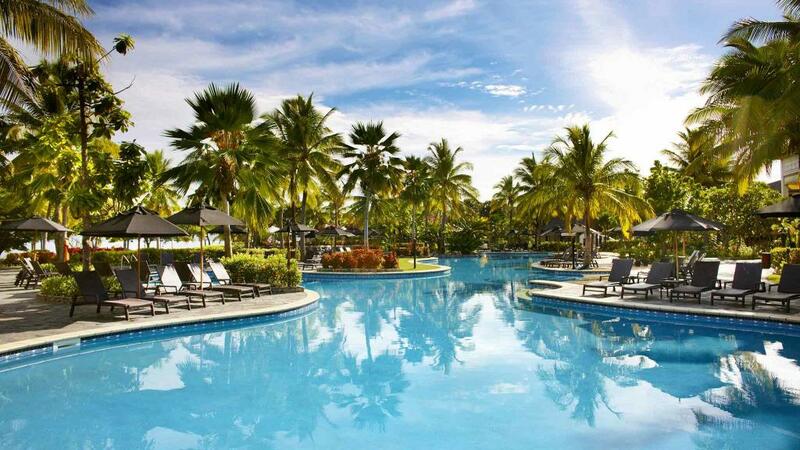 Sofitel Fiji Resort is a high quality resort, fantastic swimming pool, great food and very friendly staff. Highly recommend for a relaxing family vacation. Beautiful hotel. Immaculate grounds and rooms. Service of all staff was friendly and very welcoming. Facilities were excellent. Food was awesome. Meal package option was great. Our children loved the kids club activities that they could attend at various sessions throughout the day. Our kids are 8 and 9. The kids club staff were all beautiful friendly people. This is a really pleasant resort with an adults only pool, which we used most days as it was nice and quiet with personal butler service for your drinks. All watersports (non-motorised and motorised) are extra. The hotel has many different dining options and you can take a short stroll to other restaurants at local hotels. It is also close to Port Denarau where most island trips or snorkelling/adventure trips depart from. Rooms are comfortable, but bathrooms probably in need of a renovation soon. We paid extra for the adults only beach club, I would recommend it if you are not travelling with kids. The main pool was a hive of activity for the kids (which was great), while we relaxed poolside without the noise at the adults pool. We thoroughly enjoyed our stay at the Sofitel Resort and Spa Fiji. The staff where so welcoming, the resort and its facilities where fantastic. Our room was in a great position close to the pool and main resort facilities. Great family holiday that we all enjoyed. Sofitel Fiji was an amazing stay for our family of 5. The staff are friendly,helpful and interact with the children to a point where the children adore them. The resort is kept clean and there are heaps of activities to do around the pool everyday. The pool is huge which incorporates a slide for the kids and they love it. The sun sets right on the beach at 6.05 every night and is a spectacle that should not be missed. We enjoyed jet skiing, parasailing and swimming in the warm waters of the beach. best holiday i've ever had. in the friendliest country in the world. We booked a luxury family room which was on the ground floor only about 20 mt from the slide and pool. This was a great option...we had a little balcony with a table and chairs that we had dinner at one nt. The pool and slide was fantastic....and whilst busy it never felt over crowded. I loved the daily water aerobics classes. Staff were very friendly in the usual Fijian way. Denerau is great for food options outside the hotel and very easy for families with young children. We will be back! A Wonderful Family Holiday - Can't Wait to Return! We recently spent 7 nights at the Sofitel Fiji and cannot speak more highly of the experience. There were two families travelling together, and we both had kids who were 6 & 4 years old. Our deal had full breakfast buffet included which was brilliant and catered to just about every possible dietary and taste requirement. The staff were lovely, friendly and attentive. Our kids weren't overly interested in Kids Club but we did hire a nanny for a couple of hours a day for a few days, which was great and the kids (and adults!) loved. The rooms are a little tired, the bathrooms in particular, but they were clean which to me was most important. And honestly, we spent so little time in our rooms, it really didn't impact the holiday at all. Overall I really can't fault the Sofitel and we will definitely be going back next year! Had a great stay at the Sofitel Fiji. Staff were amazing very helpful. We had a great room over looking the beach and pool. Overall we had a great time, and can't wait to go back! Thank you Clare, for organising such a great trip for me and my family! The resort itself was lovely and all things considered we had a fabulous time. The room space was adequate for a family of 4 (all in the one room) and in good condition. Although we didn't spend much time in the room as we were by the pool for the most part of the day. Servicing of the room was good, although random. Everyday we would need to request extra items (complimentary water, towel, toiletries, bathmat and so on). This was a bit annoying. The room was serviced daily with a turn down service. The balcony small. Plenty of storage space in the room. Our package included kids eat free, but this was only applicable at one restaurant (the lagoon restaurant) for breakfast and dinner (buffet) only. Lunch at the only open restaurant at lunch (salt) was expensive. The pool & slide kept our kids entertained all day everyday. The kids club was free for some but not for all and cost F$10 per session (3 sessions per day). There were plenty of activities on offer around the pool. Activities only proceeded on the basis of participation and if you were unsure you could always check with the guys at the towel booth. We went straight to the pool area after breakfast (around 9.30am daily) and we had no problem getting 4 pool chairs beside the pool. The breakfast was nice with lots of options. The buffet dinners were also good - the oriental dinner, the best. The pizza at the Salt restaurant was also good value. 2 Pizzas F$70 was plenty for a family of 4. 1L bottle water was F$10. All round the service was great and especially friendly. Was a wonderful place to stay, everywhere you went you were greeted with a big BULA! The pool area was amazing, could actually spend all day there! the room itself was nice, lovely bedding, the shower did tend to get water all over the floor often though. Breakfast each morning was delicious. great place to stay for couple of all ages and families! Good resort and staff were excellent. Better variety & selection of food choices at resort would be my only suggestion for the Sofitel. Great for the kids good kids club great pool. Good quality food and we will return love it heaps. Not our usual style but we were very happy and we will be back again. We wanted a trip that was relaxing for us and fun for our 6 year old. It was perfect. Our daughter loved the pool slide and the kids club. She also enjoyed her facial and manicure at the spa as did I. We have stayed at the Sofitel in the past as well as several other properties in Fiji. Once we arrived at the Sofitel we felt like we had come home. All the staff were so friendly, taking the time to chat with us and the children. Nothing was too much trouble for anyone! Many of the staff remembered us from our last visit which was 2 years ago! We had booked a family room with the bunk beds but on arrival were told they were on the second floor; the luxury ones were on the ground floor, but they upgraded us for our additional night as well as our original booking to the luxury room on the ground floor so the kids could play on the lawns outside. An outstanding and relaxing time. We won't bother trying out the other resorts any more. The Sofital has won us and we will be back again next year. from the moment we arrived at check in till the time we left for the airport we had an amazing time. devastated by cyclone winston these people still kept their smiles. we couldnt fault the service from housekeeping to wait staff. buffet breaky was great every morning. kids club was great, my son stayed and actually kept asking to go back. the pool, the waterslide. was a major hit. would reccomend the sofitel to anyone wanting to go on a family vacation to fiji. We found the Sofitel Resort to be perfect. With 7 women the staff did not complain about us once. We have since made multiple friends with the staff at Sofitel and will be planning another trip in the near future. The staff at this place are absolutely by far the best! So friendly and approachable! Made myself and family feel so welcomed.Hope to visit all our fijian friends at the Sofitel again. We enjoyed the ambience and the location. Service was almost very good. Stayed at Sofitel overnight en-route to the islands. Overall great place to stay. Pool is lovely with the slide which we all enjoyed as a family. Very comfortable beds. Nothing fancy, but everything you need is there. We loved our stay here, the pool was a highlight. Family room was ideal for the four of us. Need better satellite TV options for night after the kids have gone to bed! We had two nights at the Sofitel recently and have enjoyed previous stays at this resort. The room was clean and modern. The grounds and pool area was very nice. However we had three breakfast meals in the main dining room which was not pleasant. The dining area was full of flies and seemed dirty. Certainly needs attention, not very appetising to fight the flies off your cutlery ,plates and food. We had an amazing holiday. The resort was beautiful and the staff were so friendly and accommodating. The food was pretty good especially the Fijian buffet. Some things were on the pricy side but overall good value for money. We would definitely return to the Sofitel. lovely resort with very good service. Dining choices a bit limited within resort. Harbour has some good resturants and bars. Awesome hotel, facilities and staff. was expecting to enjoy a few days of luxury for myself but the kids loved this hotel too. will definately return and recommend!! A very well maintained and run hotel. The staff are highly trained and are genuinely friendly. Food is lovely, but expensive when you have 3 children. Try to get the breakfast package if you can. Resort promptly attended to issues experienced during our stay. Food was pricey but good quality. Would stay there again. Best family holiday with young kids ever!!! The staff were great with the kids. So much to keep them busy. we had a brief 5 night holiday in fiji and loved staying at the Sofitel. fantastic location. close to the airport, so our transfer time was short. and 1 km away from port Deneru which allowed for a little bit of shopping and other dining options to the Sofitel. The pool and atmosphere the sofitel offered was a very lazed environment, which made it easy to chill out. Good value for money. Expected more water activity options. Probably needs another family dining option with the buffet expensive for what you get. Only had 6 hrs at hotel as flight 12 hrs delayed. Room ok. Great breaky. Pool excellent especially waterslide for kids. Lovely staff. Fun atmosphere. Would liked to have stayed longer. Nice place to stay and relax. The Buffet meals at the Restaurant (Breakfast and Dinner) were very good. We had issues redeeming some of the inclusions in our accommodation package, but overall it was a great holiday. Fantastic holiday. Food was great. Kids loved the waterslide and kids club. Quiet relaxing property compared to some of the others in the area. We really enjoyed our trip to Fiji. The resort was amazing and the staff were very friendly. I would like to especially mention Villi who works at the Salt bar located by the pool. He is extremely friendly and makes the best cocktails, he made the trip even more wonderful. There was only one minor issue with the resort which was the shower in the room. Every time you showered there were pools of water all over the bathroom floor making it quite slippery. Other then this, everything was amazing. We will defiantly be back soon. We all had an amazing holiday! It was a great place. The family thoroughly enjoyed it. I would recommend the Sofitel Resort and Spa for a family holiday. Dining choice is good and the food is generally presented to a good standard. Kids are well looked after with a well run Kids Club and activities on the beach and in the pool. The Fijian staff are unfailingly helpful with a ready smile and a genuine "Bula". Rooms are comfortable and quiet with the only downside being incredibly slow and unreliable WiFi. Great place for a night or two before you head over to the islands!! Buffet bfast was lovely as well.. great selections. But the pool was a real highlight for us.. with a 3yr old!! Enjoyed all aspects of the hotel and the surrounds. Loved Fiji just for some r 'n' r.
The Sofitel was wonderful! The Denerau location was very convenient and the family room layout was great - the kids could go to bed in their "nook" and the parents could still have some quite time to themselves in the room too. The pool was fantastic and a highlight for our kids, especially the slide. The service and people were wonderful. It was such a fabulous trip. We are already thinking of plans for a return trip back to the Sofitel Fiji next year! We could fault nothing at the Sofitel, it was a perfect family holiday and a good introduction to FIJI. We will definately be back! A friendly, well appointed resort. This resort has all you need to settle in and never leave. Excellent service, excellent location. Beachfront is a bit of a let down but a minor issue. Have stayed there before will stay again however it would be good to have more affordable options for families with more than 2 children. Otherwise we love Sofitel Fiji. Had a great overnight stay and everyone very friendly and helpful. Lovely staff, well-equipped and clean rooms, great value and location. We had a fantastic stay at The Sofitel, and are already discussing going back. The kids had a wonderful time! The staff are great with kids and are always so friendly. Food was fantastic with lots of variety. Location was great too. I would like to say how wonderful everything we experienced at the Sofitel Fiji was on our recent family holiday. We felt very welcomed and attended to during our stay. Overall, our experience was brilliant, as we had our 3 year old and 1 year with us as well and they had a blast! We hope to make it back soon, for another relaxing, fun filled family holiday. hotel staff were great with our kids, and we had a memorable family holiday at the Sofitel. The sand is quite dark, Pacific sand one imagines white before. The hotel is very suitable for families with children. The water is like a bathtub. We liked it well. We went last year in peak season and it was crazy busy. When we got there this time there were only about 5 groups around the pool. Well worth taking leave early. Great place to stay, with plenty to do. I chose this properties over the others in the area solely because of the waterslide and it didn't disappoint. Our 5 year old spent hours on it (barely stepping into the rest of the beautiful pool). I had one of the best meals at the Salt restaurant, and the buffet breakfasts were delicious. The ladies in kids club were excellent and even got my almost-2 year old with severe separation anxiety to happily play there for 2 hours with a nanny. My only gripe with the hotel is that the set up of the coffee and tea area and in-room safe was such that my toddler had easy access to the buttons on the safe (and locked it several times) and the glassware and mugs. Our 3rd stay, lovely resort. The waterslide was a favourite for our 4yo son! loved it. staff were proactive and knew who we were from day one in such a big resort. loved the services and activities offered. food was great as were facilities. cannot fault the sofitel at all and would stay in another sofitel facility in the future. We only had a one night stop over, nice room, comfortable beds, excellent breakfast, very helpful staff, easy to get to marina for shopping, eating & island transfers. Would go back. Loved the pool, beach and facilities. Had an overnight stay here before heading out to islands. We weren't here very longs but rooms and service were of a high standard. Hotel is a very large hotel but is ideal for that short stay. Had a great time and will be back for more soon. recommended it to every one at work or who ever ask how we went. Great people working there very friendly and good resort. thanks great time. Highly recommended, great location, lots of activities, great pool and restaurants are high quality. Rooms are clean and have great water views . Staff are amazing. Superb 5-star accommodation on Denarau island, only 20 min cab ride from airport. Perfect for families but also for couples. Excellent gym. Best of all was the food, which was just amazing. Definitely stay here rather than Plantation Island. Excellent hotel catering for all ages. Beautiful grounds and pool was fantastic. Day spa was sensational, with all staff throughout resort just so very accommodating. Enjoyed our stay immensely. We loved the bunks for the kids in the family suites. Made our stay very comfortable to have them in their own bed rather than sharing with each other. As with all resorts in Fiji, the people are just wonderful!! Great way to start and finish the holiday! We came to Fiji for an island holiday and book ended our stay on the island with nights at Sofitel Fiji. We're so glad we did! It breaks up the travel and has a great pool (the kids love the little water slide) and good varied food options. The family room was also very good with a separate nook with bunk beds for the kids. Last, but not least, the staff were mostly very efficient and extremely friendly! When (not if) we holiday in Fiji again, we will definitely stay at the Sofitel to start and finish our break! WE HAD A GREAT TIME. tHE ONLY THING WE HAD TO CHASE UP WAS OUR SPARKLING ON ARRIVAL.WE DIDNT GET WELCOME DRINKS. Resort facilities were great buy food overpriced. Overall we were happy with the resort facilities, the staff were great but extremely disappointed with quality of the food for the prices they are charging. They are basically charging for 5 star quality food but serving 2 star. For example $20 aud for a burger or $18 for a toasted ham & cheese panini. Wouldn't stay there again for that reason. We stayed here for a few days after being in the Mamanucas. The Sofitel is what it is: a well-placed large resort. While our stay here was fine, I would not want this to be my vision of Fiji, as once you are at the resort, you could really be anywhere. The rooms are clean if not a bit small. Pool is great... for kids (I wouldn't want to try for a lazy doze there.) Beach is not the prettiest but is a good stretch for a walk and fine for swimming. Food was sometimes good sometimes bad, never amazing. Spa awesome, but spas are awesome! Heaps of activities on offer (for a price) and very easy to walk or catch a ride someplace else to eat or explore. Bottom line: we probably wouldn't go back but not due to a bad experience, just a preference for a different experience. We only stayed one night - a good hotel for families. We found the staff incredible, particularly for families. They are so warm and inviting and great with the children. Our room was disappointing. The A/C was not working properly and so we struggled to sleep properly at night...as did our two small children, which made things worse. The ensuite/kitchenette was also looking very old and worn. Customers should be made aware of the issues prior to booking (a simple message on the website) and be given a discount since they're not receiving the standard of accommodation they expect for the cost. Fantastic location close to Nadi airport and Denarau Marina. Loved how we had the choice of Restaurants at the Sofitel or close to the Marina where there was a good selection too. Great for doing day trips to the Island. The resort itself was really relaxing, and loved the Spa.